Settlement at Tumacacori dates back at least to the early 17th century, when this was the site of a Pima Indian village in north Mexico. The first European visitor was the Spanish Jesuit priest Eusebio Kino, who in 1691 founded a mission at Tumacacori, 18 miles north of Nogales beside the Santa Cruz River, and shortly afterwards established a similar site at nearby Guevavi. 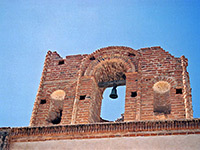 An Indian revolt in 1751 caused the Tumacacori mission to be relocated at the present site on the west bank of the river, receiving the full name of Mission San José de Tumacácori, soon after which the modest buildings were enhanced by construction of a small church. As part of a political change all over the Spanish empire, the Jesuits were replaced by Franciscans in 1768 who instituted further improvements by adding more buildings, redecorating the church and transferring the mission headquarters from Guevavi; like Calabazas (a third mission, built around 1760), this site was abandoned soon after, because of attacks by Apache Indians. 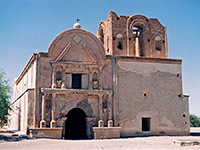 It was the Franciscan Catholics who in 1800 began construction of a new, much grander church at Tumacacori, a project that took over 20 years though when complete the church was fully used only until 1828, when the Mexican government forced all Spanish settlers to leave the country. The mission was closed completely following the end of the Mexican-American war in 1848, and became US property in 1853 when land south of the Gila River was transferred to Arizona (the Gadsden Purchase). Little remains of the Guevavi and Calabazas settlements, which were added to the then Tumacacori National Monument in 1990, but the main site has a varied collection of buildings over an area of 5 acres, centered on the impressive adobe church, which is missing its original contents and most of the interior decor, and has a replacement timber roof, but the exterior remains substantially unchanged. 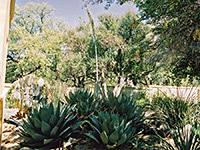 The park is situated along the I-19 frontage road, a fragment of what was the main highway from Nogales to Tucson until construction of the interstate in 1972, but is now just a sleepy back route through wooded land beside the Santa Cruz valley. The closest I-19 exit is 29 (Santa Gertudis Lane). The compound is on the east side of the road, enclosed by a high whitewashed wall, in a tree-lined, residential neighborhood, and the site is quiet, peaceful, and not often visited. Admission to the historical park (2019) is $7 per person. Entry is through a large wooden door set into the wall, which opens directly into the cool, rather gloomy visitor center, quite a contrast to the usually bright blue sky and searing heat outside. 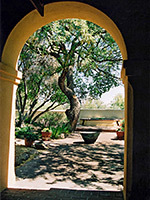 The center has a good selection of local-interest books, a museum and an auditorium for video presentations about the history of the mission. The walking tour of the site leads first through several interlinked rooms with open doorways, and to the enclosed courtyard garden, filled by mature trees and Sonoran desert plants. The church is a hot, 200 foot walk away across the main quadrangle, much of which is bare soil though other parts have trees and lesser buildings such as residential quarters. The original roof was destroyed many years ago, and a combination of effects of the weather and souvenir hunters meant that little of the original interior was left by the time preservation started in the 1920s. A replacement roof was added and the structure stabilized, though there was no extensive restoration. The interior now is cool, dark, evocative and authentic, despite continuous piped music. The main chamber has a nave, altar and remains of a choir loft, with links to smaller rooms including a baptistry, sacristy and sanctuary. A locked staircase leads up to the belltower, the only part of the church not completed because money for the project ran out before its domed roof was built. Behind the church are a granary, mortuary and a cemetery, though no original graves have been identified. The nearest towns with hotels close to Tumacacori National Historical Park are Green Valley (22 miles), Nogales (18 miles) and Tucson (45 miles).